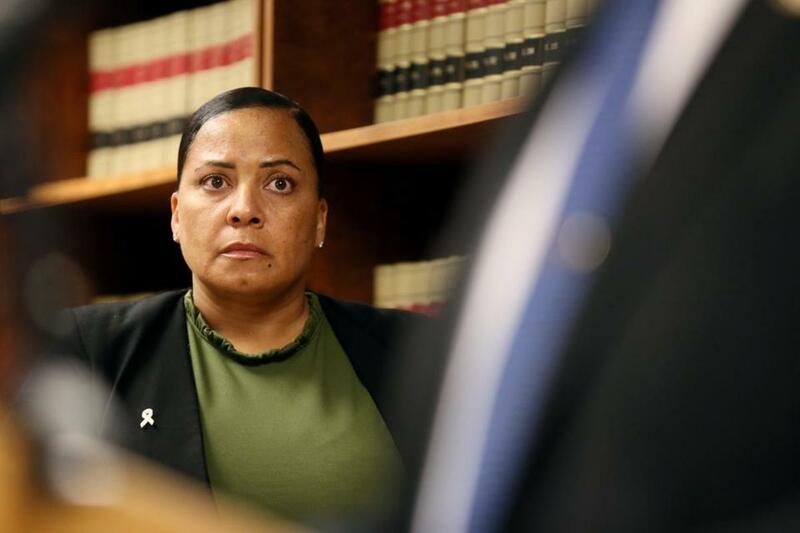 In a break with tradition and in keeping with a campaign promise, Suffolk District Attorney Rachael Rollins Monday named a four-person team to oversee the investigation into the use of deadly force by Boston police officers last month. The four-person panel will meet monthly to assess the law enforcement inquiry into the death of 36-year-old Kasim Kahrim who was shot after he exchanged gunfire with two uniformed patrol officers on Feb. 22 in Roxbury, wounding one of the officers. Kahrim allegedly opened fire on the officers after they encountered him while he was driving a minivan near the intersection of Allerton and Pompeii streets in Roxbury around 2:20 a.m., according to police. The officers returned fire, striking Kahrim, who drove away before crashing on George Street. Police said they found a gun inside the minivan. During the incident, Officer Mark Whalen was shot several times in the upper torso, police said. The district attorney’s office said it may be the first time in Massachusetts that an outside panel plays an active role in a deadly force investigation. Rollins was elected last year to succeed Conley and during the campaign said she saw a need for a new way to investigate deadly force cases to increase public confidence in their validity. Under state law, district attorneys have legal control over death cases in their jurisdictions. The panel will meet with Rollins and First Assistant District Attorney Daniel Mulhern who is currently assigned to oversee the joint inquiry by Boston police and Suffolk prosecutors. ■ Phillomin Laptiste, executive director of Dorchester’s Bowdoin Street Health Center, who was born on Bowdoin Street and spent her professional life in the Bowdoin/Geneva neighborhood where gun-related violence frequently takes place. ■ David E. Meier, chief of the homicide unit under Conley from 1996 to 2008. He was a member of an internal panel during Conley’s years that identified potential wrongful convictions. He is now a partner with the Boston law firm Todd & Weld. ■ State Police Detective Lieutenant Robert Murphy, who commands State Police detectives assigned to Rollins’s office. Murphy is a 20-year law enforcement veteran whose career has included homicide investigations. Murphy was one of two State Police detectives honored for the investigation into the death of Bella Bond, whose body was found on the shore of Deer Island. ■ Retired Superior Court Judge Charles T. Spurlock, who was on the bench for major trials, including murder cases between 1992 and 2010. Earlier in his career, Spurlock was a Roxbury Municipal Court judge. Danny McDonald of Globe staff contributed to this report. John R. Ellement can be reached at ellement@globe.com. Follow him on Twitter @JREbosglobe.